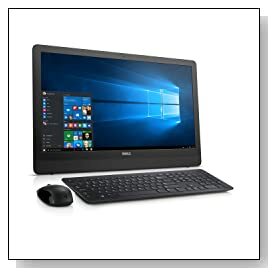 Dell Inspiron i3459-5025BLK as part of the 24 3000 series is a sleek 23.8 inch Full HD touch display all in one desktop computer for the whole family with a Skylake ultra low voltage but powerful dual core Intel i5-6200U processor at 2.3GHz to 2.8GHz speeds with a Passmark score of 3900 at the time of this review for responsive performance along with the large 8GB DDR3L SDRAM memory at 1600MHz for being able to multitask smoothly and efficiently, 1 TB Serial ATA HDD as very spacious storage to save all your common and multimedia files but a bit slower at 5400rpm spindle speed (than SSD) and Windows 10 operating system with Windows 7 Start menu, Cortana digital secretary, Continuum to make it much easier to switch between two devices and Microsoft Edge browser that lets you type on a page directly. Windows 10 resumes and boots up faster than previous Windows versions. Black chassis Inspiron i3459 looks nice enough to be put right in the middle of your living room, has a slim design, weighs about 17 pounds so it is fairly heavy to be moved around too much. For connectivity it includes a DVD Optical Drive that reads and writes to DVDs and CDs, 802.11ac long range and faster wireless + Bluetooth 4.0 Dual Band 2.4&5 GHz, an Ethernet port with RJ-45 connector, 2 x USB 3.0 ports, 2 x USB 2.0 ports, an HDMI output if you wish to connect to a second large display, 4-in-1 Media Card Reader and 65 Watt AC Adaptor. It is very easy to set up right out of the box as this is a convenient single cord unit with decent wireless non-backlit keyboard with numpad and mouse and has a robust stand contrary to what the pictures may suggest. 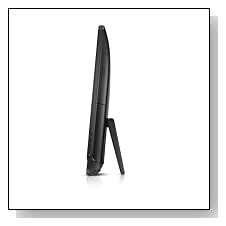 23.8 inch big screen LED-lit Truelife Full HD touch display with 1920 x 1080 pixel resolution and IPS panel offers very clear images with vivid colours and wide viewing angles vertically and horizontally. Intel HD 520 integrated graphics with shared memory is comparable to the dedicated NVIDIA GeForce 820M in overall performance and allows you to play the games of 2015-2016 at low settings and resolutions. You’ll hear great immersive sound through Waves MaxxAudio and integrated speakers and high definition 720p webcam is ideal for Skype chats with friends and family. You’ll get 30 day trials of McAfee LiveSafe and MS Office which you can choose to pay for and extend but we recommend you remove McAfee and download free AVG online. This is pretty good value computer for all that you’re getting: The Full HD huge 23.8 inch touch display with IPS panel which is good for watching movies on large screen and no matter what you do it will be a lot easier to work on a very large display, great sound for songs and movies, and all the latest specs and hardware that will make things run faster and smoother. 8GB RAM is a lot of memory for most uses and will be more than enough except for very advanced gamers. Late 2015 release dual core sixth generation Intel i5-6200U with Thermal Design Power of 15 watts includes both turbo boost and hyper threading, is capable of handling demanding office and multimedia as well as simple daily tasks and the new software and hardware means it will be current for at least another few years and as long as you are not an advanced gamer who wants to play the latest titles at high settings then this is good for you or your family.